The biggest headache, apart from the altitude, is planning flights to lukla. In high season it can be difficult to gets seats, so book as early as possible . organised groups tend to take the first few flights out of Kathmandu. Independents need not fret too much, thought, since flights normally operate well in to the morning and sometimes even later. Many trekkers roll up in Kathmandu and secure a booking for a couple of days or so ahead-its pot luck. Following the basic route in to Everest there are no alternative routes between lukla and namche .The big decisions are made in namche after a day of acclimatization. Time is the main factor for most, there is a wide range of side trips of varying degrees of strenuousness. The next factor is whether to take a guide, a porter guide, a porter, both or to carry all your own gear .decisions, decisions. Many trekkers carry all their gear themselves. having a guide is not necessary, but it does give employment to the local people .having a porter is perhaps a good compromise, but be aware that there can be a shortage of porters available in high season at lukla.Taking a porter guide from Kathmandu obviously adds to the cost although air ticket for locals are much cheaper .funding one in Kathmandu can be daunting, so ask at one of the many trekking agencies: see appendix. The majority of trekkers will only suffer manor effects of altitude if planning enough time. Altitude problems seem to occur when climbing to namche, heading to Dingboche and of course on kala pattar. an easy day or two en routes usually avoids most stubborn effects. In any case it’s very easy to retreat downwards if symptoms persist. As for accommodation, the whole area that trekkers are likely to visit is supplied with good lodges’ as well excellent, sustaining food. It really is a holiday trekking in the Everest region these days, with double glazing and a leave of comfort unknown else wherein Nepal. 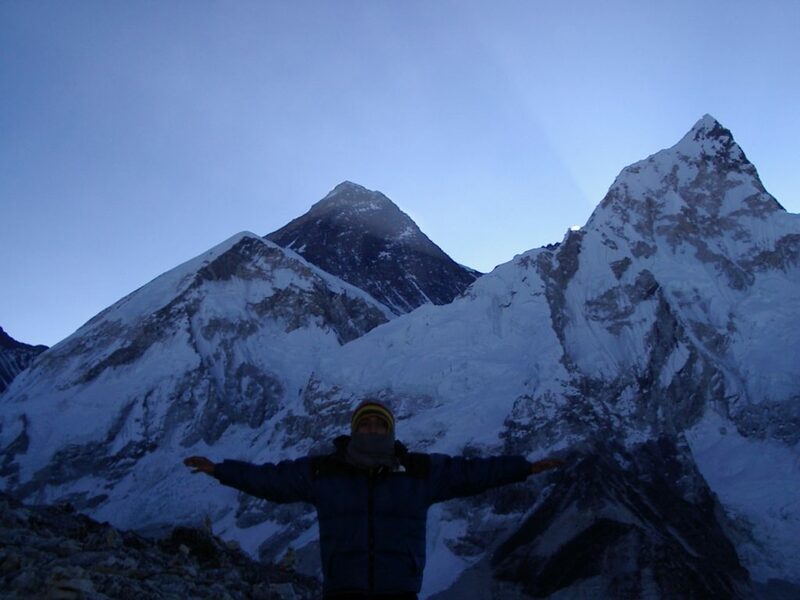 Concerning the weather, the Everest region can be freezing for much of the time. Just after the monsoon and until mid Octobers the higher areas suffer from lingering snow. Days are normally a dream once the sun is up and it can be seriously hot at midday. Wind tends to be less of an issue during the autumn season, but spring can experience bluster. Remember wind has an impact on the temperatures and chill factor. Be aware that weather patterns have been much more unreliable recently. 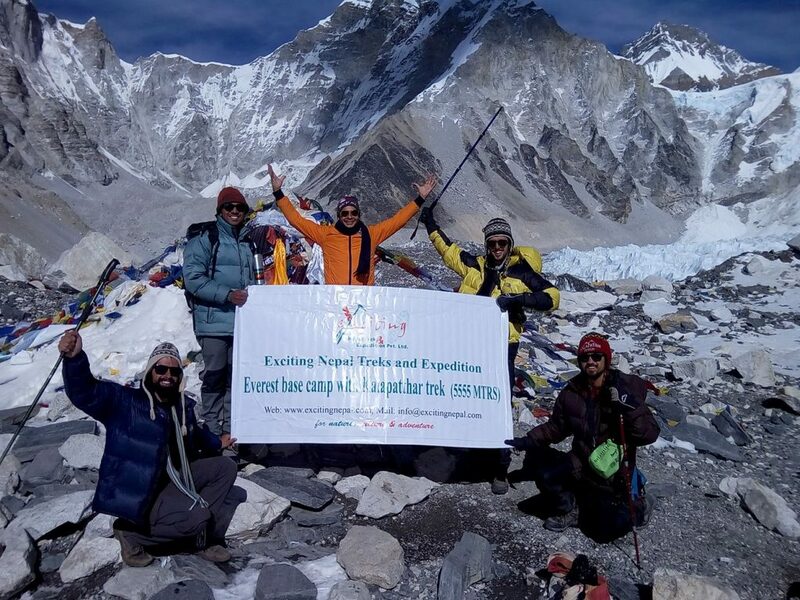 Everest Base camp trek Start from the altitude 2,860 meters (9,383 ft) which is in Lukla where the first steps begins for your Everest base camp treks. It is just about more or less 30 minutes flight form Kathmandu and the best time for the flight is early in the morning before the clouds and wind. For the Everest Base camp trek the first altitude is 2860 Mtrs and it is end to the 5555 mtrs on the Kalapatthar which is the best view point of Mt. Everest, however the Everest base camp is situated at the elevation of 5,380 m (17,600 ft). Which month of the year is good for the Everest Base camp trek? Everest Base camp is the trek which one of the most popular trek in the world which offer not only the view of world highest peak Mt. Everest but it also offer the unique culture and traditional of Sherpa. Along the trek, trekkers can see the ancient monastery related to the Buddhism. This Himalaya trekking can be the life time experience for the trekking lovers. March , April , May are the popular months and these month have great weather with stunning views. March is a bit colder than April. Trekkers always need to carry some warm cloths during the treks as you are heading to high altitude too. The tea houses along the treks will provide blankets but sometimes there can be shortage but it is always recommended to carry the sleeping bag. Another best time of the year is from end of September to beginning of December. This time of the year offer almost guaranteed clear weather and this is the reason why these two months were the main trekking season in Nepal so skies are clear and you should have crystal clear views of Himalayas, but still we can find many trekkers in this routes almost all the year to avoid the crowed. The following routes primarily cover those regions easily accessible to trekkers. The treks are particularly suitable for independents trekkers, although groups also use them as they are the most popular trails, these treks have good lodges bad teahouses offering sustaining food. Others regions mentioned in outline remain the domain of campers only. Why trek a trek to Everest when there are so many is other less frequented treks in the Nepal Himalaya, like Ganesh himal”, because it’s there “is good enough region for most, since it is the highest mountain in the world. However, as dominating as Everest is. There are many others reasons to trek in the khumbu region. The Everest region is a kaleidoscope of Buddhist culture, colorful festivals, varied vegetation, astonishing scenery and most of all welcoming people. The Sherpa have been guiding and hosting foreign visitors since 1921, when the first expedition set out across Tibet from Darjeeling, quaint and historic monasteries watch over traditional picturesque villages. Trekking in the Everest region, in terms of ups and downs and difficulty, is not that hard. It’s the altitude that makes the difference. There are endless opportunities in the khumbu to design your own amount of toil and trouble, with so many valleys packed in to a relatively, small area. It’s not necessary to cross any high passes. Since there are to the side of the main routes. Of course some days are hard and bitterly cold, and the food may take hours to come .however, as with any trek in Nepal, the joys of the trek far outweigh the hardships. Day 01: Fly from Kathmandu to Lukla. Trek to Monzo. Early this morning, you will be transferred to the domestic airport to catch a flight to Lukla. The 35 minutes flight is a scenic and a perfect spot for mountain-seeing. The view from the flight is more like a trailer to the entire movie that lies ahead in your trek. Once you reach Lukla, you will trek to Monzo. It will take you about 4hrs. You will spend the night in a local lodge. 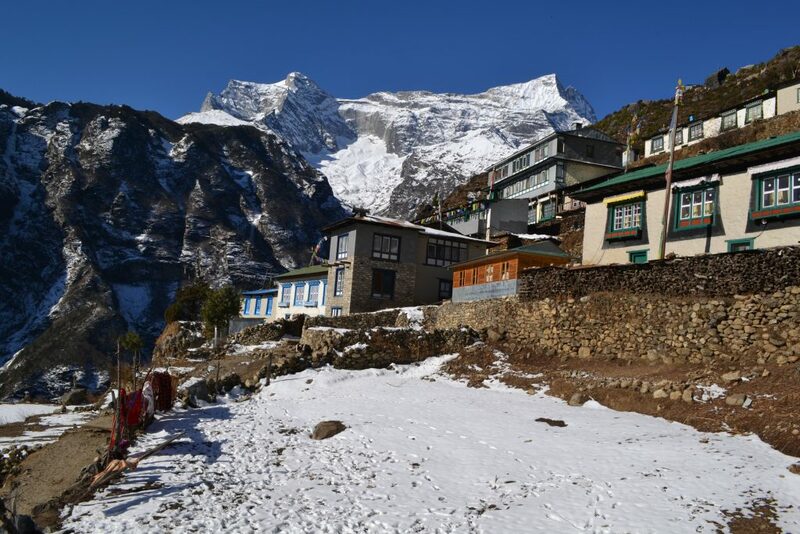 You will trek to Namche bazaar from Monzo. The route will lead you into Sagarmatha National Park. Its remarkable beauty has it enlisted under UNESCO world heritage site. The park is also home to several wildlife inhabitants. Namche Bazaar lies at 11,270ft and is also an unofficial capital of the Khumbu Region. You will spend the night in a local lodge in Namche bazaar. You will need to rest for a day in Namche Bazaar. The rest is a must for acclimatization. However, you will not be spending this day idle. 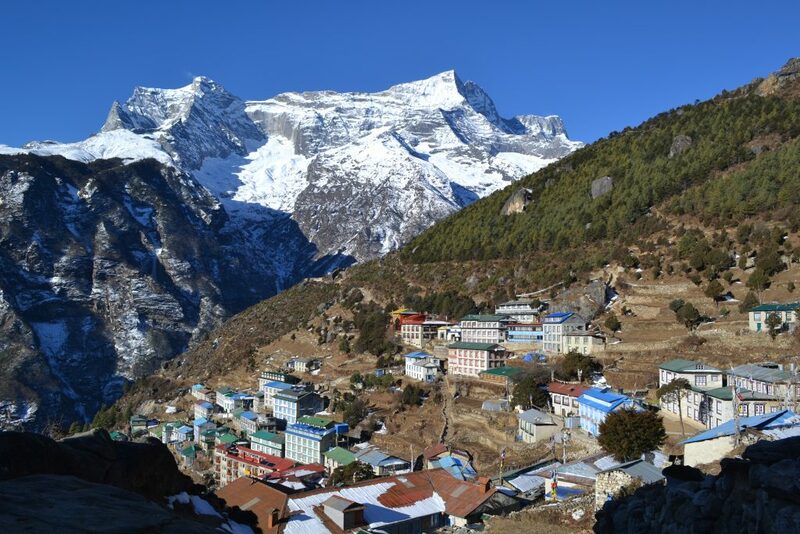 You will be taken for sight-seeing and small hikes around Namche. You will spend the night in Namche Bazaar. Day 05: Trek from Tengboche to Dingboche. Day 09: Trek from Phireche- Khumjung Village. You will be descending down to Khumjung village. The village is beautiful and is resided by Sherpa people. You will get a chance to acquaint yourself with their culture and life style. You will spend the night in Guest House. Day 10: Trek from Khumjung Village – Manjoo. The walk to Manjoo is through trail that weaves small elevating and descending valleys. The view of Everest is excellent along this trail. You will also see several mani stones stretching across the trail. You will spend the night in a Guest House. The walk from Manjoo to Lukla will take you about 5hrs. Manjoo is a small village with scanty settlements. The view of the mountain seen from this place appears to be stretching far along the skyline behind the green hills. You will spend the night in a local lodge.